Beetles that depend on dead or decaying wood, often with weighty frames and photogenic jaws—called saproxylic beetles—are fascinating insects, and often kids’ favorites (think stag beetles). According to a new report, they are also some of the most threatened, with nearly one-fifth of Europe’s saproxylic beetles at risk of extinction due to major declines in old trees. The International Union for the Conservation of Nature (IUCN) warns that their widespread decline could have serious repercussions for other species and the ecosystems the beetles inhabit. The conservation group determined a number of causes for the decline in the veteran trees that the beetles rely on for at least part of their lifecycle, ranging from logging and wood harvesting to urbanization and tourism to increasing wildfires. According to the report, “old and hollow trees have become increasingly scarce around the world, including in Europe, due to land management practices.” This is a major problem for saproxylic beetles, as they wait for old trees to start to disintegrate before colonizing them and laying eggs. 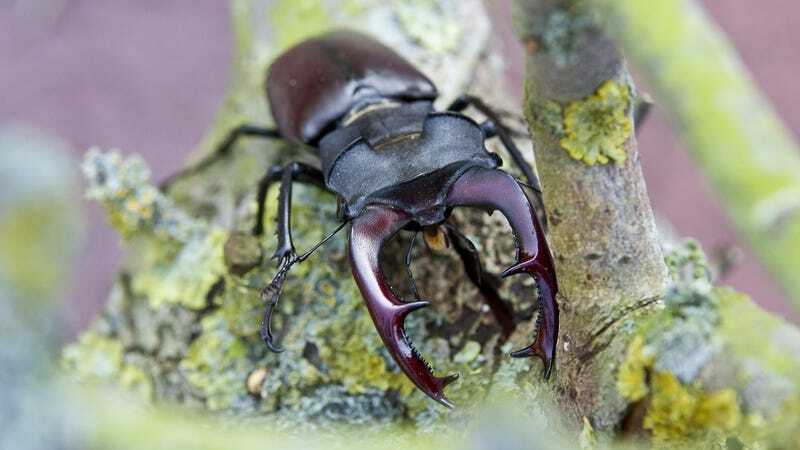 Dr. Keith Alexander, a leading UK expert on the beetles who served as the main advisor for the study, told Earther that measures requiring a minimum amount of deadwood in landscapes should be implemented to ensure the beetles’ survival. “Veteran trees should be preserved in forests, pastureland, orchards, and urban areas,” he said. The Iphthiminus italicus was assessed to be endangered. In Europe alone there are some 29,000 species of beetles, around 4,000 of which are believed to rely on dead or decaying wood for at least a portion of their lifecycle. While the IUCN was able to assess the well-being of some 700 species with the help of 80 European experts, data is lacking regarding many of the beetles. The report suggests that increased monitoring should be a priority. Since saproxylic beetles depend on new generations of trees getting old for their long-term survival, even if a beetle’s overall population is strong it could be at risk if new host trees are not becoming available. The beetles play an important role in natural processes, such as decomposition and nutrient recycling. They are also a favorite food source for a number of birds and mammals, and some are even pollinators. These vital services are important for a healthy ecosystem. According to the report, some progress is being made as the forestry sector becomes more aware of the importance of “forests with a diverse tree age structure, native tree species, and a sufficient number of mature and decaying old trees in different stages of aging.” Historically, the presence of deadwood was considered a “sign of neglect and poor forest management,” which meant forests would be quickly cleared of the valuable standing or even fallen dead trees. Old trees in urban environments are also removed for safety reasons. Now, countries like the UK, Italy, and Romania are undertaking ancient tree inventory projects to help ensure the old trees are no longer discarded like waste, but valued for their many benefits—including keeping these charismatic beetles alive.